Things I do . . .
. . . and more. So much more. Oh my goodness...that dog looks exactly like mine! He actually recently adopted us...just showed up and never wanted to leave. He's such a great dog...but we have no idea what his breed is. He looks sort of like a german shepherd mix but he is very small...probably 40 lbs??? Anyways sorry for the long comment...just wanted to share my excitement! Great post...nice shots! Now I have garden envy. It looks like a wonderful day you've pictured there-- and the shelf full of goodies has my mouth watering! Amazing pictures! Your garden is lovely. Mine was overrun with weeds this year. This is the first time in 20 years that I haven't canned tomatoes! fookadesigns - my pupper, Halley, recently found us too! We've only had her about a month now. She's a blessing. She's a pretty big dog, though not as big as my old dog, Karma. BTW, she's a Lab & Burmese Mountain dog mix. Thanks carapace! Mind you, these are images from the past few months - not all a single day! Your canning brings me back in time...I loved to can beans.. pickles... Your post makes me smile.. Beautiful Blog! Always have gardening envy, your reaped rewards look so satisfying. I hope we can do this someday. I miss having grown up in a small town on Cape Cod, where we all had gardens and wild fruits galore! Oh I love this photo series! Everything looks SO beautiful! 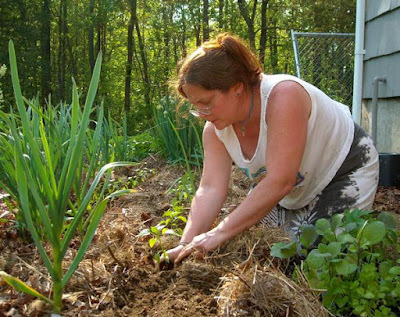 Loved how dirty you were after gardening - now that's throwing your heart and soul into it. Oh my goodness! I want to come and hang out with you for a day! What a fun time you have. :) I'm truly inspired to my core to get off this computer now and go PLAY! Peace beautiful goddess! fooka: ours looks lots like that & 40lbs'ish, my bros too - both are shepherd mixes; one with sharpai & one w/beagle...maybe he's like them? Ah, lovely to have a glimpse into your life. Your life feels wonderful and alive. I truly feel as though I am getting to know you through blogland, your art and products I have the pleasure of having. You are indeed a treasure! Such a gorgeous basket of bounty! Your photographs always tell such a rich story...thank you for sharing them! You are doing really good in the canning department..I use the freezer..Good to be supplied, I think. Like all the other things you do too.. The photos are all so vivid. I love the basket photo. Are those Elder Berries on the basket? Some great memories in those pics. I admire your earthy skills. I am trying to learn but unfortunately it doesn't come naturally to me. Pictures do speak louder than words. All beautiful! Such beautiful photos! They really tell a story and it's a fabulous one! They invoke such joy with life and that is truly inspiring. Thank you so much for sharing these! Those can goods look yummy! Your garden harvest is very colorful...I am harvesting the last of mine this week, before we frost. Great pics! I love your photos! Fantastic tapestry you just wove. Pictures really are worth a thousand words. looks like you do a little of everything! pics are great - it makes me feel relaxed, just looking at them! Fantastic post! so relaxing just to get such eye candy. thanks for sharing!!! Your life looks wonderful, so rich and full. That picture of you and your dog just made my morning! I am a dog lover, have 5 of my own, and that dog has such love in his/her eyes, as do you. Wonderful shot! Thanks!